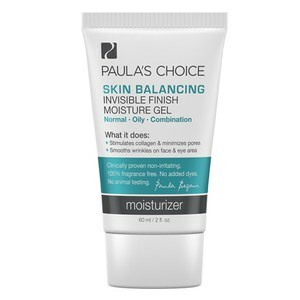 Oil-free and lightweight, the Skin Balancing Ultra-Sheer Daily Defense SPF30 from Paula's Choice targets uneven skin tone and banishes breakouts to leave you with a clear, healthy-looking complexion. Developed for combination, oily or acne-prone skin, the moisturiser regulates oil production and improves skin tone by drying to a smooth, matte finish. Infused with antioxidant green tea extract and broad spectrum protection to shield from environmental aggressors and boost the skin's natural defence, whilst oatmeal and willow bark extract eliminate irritation. Prevents signs of ageing, including wrinkles, brown spots and discolourations, so you can experience a soft, flawless complexion. E.N. Apply liberally before sun exposure as the last step in your morning skincare routine. Allow just a moment to dry before applying make-up. Aqua, Homosalate (7%) (sunscreen agent), Benzophenone-3 (4%) (Oxybenzone, sunscreen agent), Butylene Glycol (water-binding agent/humectant/slip agent), Butyl Methoxydibenzoylmethane (3%) (Avobenzone, sunscreen agent), Silica (absorbent), Octocrylene (2%) (sunscreen agent), Camellia Sinensis (Green Tea) Leaf Extract (antioxidant), Aloe Barbadensis Leaf Juice Powder (water-binding agent), Ascorbyl Palmitate (vitamin C/antioxidant), Phospholipids (cell-communicating ingredient), Superoxide Dismutase (antioxidant), Adenosine (cell-communicating ingredient), Tocopherol (vitamin E/antioxidant), Bisabolol (anti-irritanting agent), Boerhavia Diffusa Root Extract (antioxidant/anti-irritant plant extract), Colloidal Oatmeal (plant based anti-irritant), Pantenol (skin-conditioning agent), Ginkgo Biloba (Ginkgo) Leaf Extract (skin-conditioning agent), Salix Alba (Willow) Bark Extract (anti-irritant), Cetyl Dimethicone (skin-conditioning agent/emollient), Aluminium Starch Octenylsuccinate (absorbent/thickener), Acrylates/C10-30 Alkyl Acrylate Crosspolymer (film-forming agent), Titanium Dioxide (Nano, opacifying agent), Sorbic Acid (preservative), Sodium Hydroxide (pH adjuster), Steareth-21 (emulsifier), Steareth-2 (emulsifier), Polysorbate 20 (emulsifier), Disodium EDTA (chelating agent), Phenoxyethanol (preservative). Contains Oxybenzone. I have an oily skin and actually didn't' notice the skin balancing effect but doesn't add shine, the texture is not very creamy and heavy and I really like that. The SPF works really well! It also works well under make up. Will buy it again. I have an oily skin type and I have to say this cream is really fantastic. Its very light on the skin, goes into the sking very fast which is great in the morning before applying the make-up. I could see a major difference from day one, my skin was not shiny at all only until after 6 hours and even that was only 20% comparing to how it looks like without using this cream. 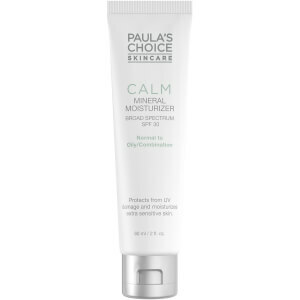 The pores are minimised, the SPF works great, really this cream is amazing. I am already at my second purchase and will not stop here, I cannot recommend it enough! Well done Paula's Choice and well done lookfantastic for selling this great product! Great product for my combination skin. Have an oily T-zone and dry cheeks. This cream balanced my face and I'm pleased with it. Will buy again.